Our patient worn sensor wirelessly links with the pre-configured tablet to continuously report 24/7 activity, body position, and temperature data. Our pre-configured 4G tablet provides education and encouragement to patients through each step of pre-surgical preparation and post-surgical recovery. Our secure online dashboard provides evidence-based rehabilitation data, and actionable alerts allowing staff to intervene prior to costly readmissions. "I found the system very helpful and satisfying. My progress, pain status, daily range of motion tests and communicating with staff when any concern came up. Awesome machine, thanks and a great big thanks to the awesome understanding staff"
"Claris Reflex is allowing us to discharge patients much faster than other patients." 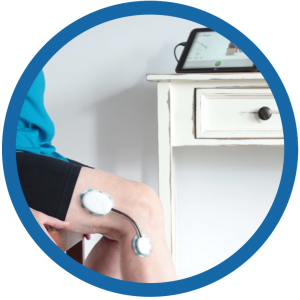 "A very helpful tool for TKR... sets the guidelines for exercise and icing and great for showing the range of motion when exercising, otherwise it is hard to know if you are making any progress at all"
"It has all the tools you need. Moreover is a very dynamic tool that is constantly being updated and enhanced with features." "Claris Reflex is a significant innovation that has allowed us to streamline care for our knee replacement patients. It’s unlike any patient management solution we’ve used before: for our older patients, the product is intuitive and simple to use; and for our staff, it’s enabling us to provide the best care possible while reducing our overall costs." "The program made my life easier, too. I didn't need to remind Bri to exercise or ice. Just had to make sure we had enough ice. Glad it went so quickly and I don't need to wait on him or chauffeur anymore. :-)"
"Because Claris Reflex provides superior in-home support for our patients, we are able to discharge them early – this has really eased the pressure on our staff, and comforted our patients." "I really believe that the program was a tremendous benefit and I am sure other people could benefit also. Thank you so much. :-)"
"Now that we are getting incentivized by our outcomes, Claris Reflex has been a really valuable tool to actually optimize our financial return in the business, and more importantly, the patient getting better quicker." "Claris Reflex is a significant innovation that has allowed us to streamline care for all of our orthopedic patients." "It’s unlike any product we’ve used before: for our older patients, the product is intuitive and simple to use and they feel reassured knowing that we are on hand 24/7 to answer their questions." "I was kicked out of physical therapy early and told not to come back! Apparently I am far advanced over what is typically expected. I can go up and down stairs more normally now than the last 35 yrs. :-)"
"The sensor is awesome and a friendly reminder to follow through with all procedures one needs to do to ensure a quick and successful recovery, and the tablet was always on the lookout for any problems that may arise."